Quectel Wireless Solutions, a leading global supplier of Internet of Things (IoT) modules, announced that two of its LTE modules have recently received certification from Vodafone for operating on the carrier’s global LTE wireless network. As stated in the certification letter, Vodafone has tested Quectel’s LTE Cat 1 EC21-E and Cat 4 EC25-E, and the results showed that the two modules are approved on all Vodafone and Partner networks. Based upon Qualcomm’s MDM9x07 modem, the two Vodafone certified modules were designed specifically for overseas markets including EMEA, Korea, Thailand and India, and can support worldwide coverage of LTE and UMTS/HSPA+ networks. 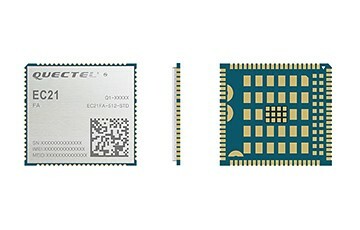 Quectel’s EC21-E module features cost-effective, low power LTE connectivity, and delivers 10Mbps downlink and 5Mbps uplink speed. These make EC21-E an ideal solution for IoT applications that do not require full LTE speeds or huge bandwidth, but emphasize on the longevity and reliability of LTE networks, such as security, fleet management, asset tracking and smart metering. Adopting the 3GPP Rel.11 LTE technology, EC25-E offers 150Mbps downlink and 50Mbps Uplink data rates. It is compatible with Quectel’s UMTS/HSPA+ UC20 module and EC21 module, allowing for flexible migration from 3G to 4G. EC25 also support Windows, Linux and Android operating system. Besides Vodafone, other variants of EC21 and EC25 series have already passed tests by Verizon, AT&T and Softbank, respectively.